NEW YORK (Reuters) - Salvatore Grillo was walking his Labrador retriever near Brooklyn's Prospect Park on a cold morning in February when he heard what sounded like a muffled explosion. Minutes later, emergency responders were hovering over the 71-year-old as he lay unconscious on the ground. Police said an underground blast had blown a cast-iron manhole cover skyward and the heavy metallic disk came crashing down on his head. While the seriousness of Grillo's injury is unusual, manhole "events" have become all too common in the country's largest metropolis. In the snowy first week of February, Consolidated Edison Inc, the local utility, tallied about 600 "smokers," fires and occasional explosions involving manholes, part of a seasonal surge that plagues New York every winter. Manholes are entry points to a labyrinth of electric cables, many of them aged and decaying, that snake underneath the city streets. In winter melting snow mixed with de-icing salt can seep through, causing frayed low-voltage cables to fail. That can trigger fires, smoke and explosions that can send manhole covers flying. "These incidents are yet another example of New York City's outdated infrastructure. It's well-known that saltwater and exposed electrical wires are a dangerous combination," said New York's Public Advocate Letitia James. "If we want a safer city, we must do more to address this issue." Cables have an expected lifetime of about 40 years, but in Manhattan, 5 percent of low-voltage distribution cables were installed before 1930, according to a 2014 analysis. In addition, overheating and even gnawing rats can hasten the deterioration. It is the oldest electrical system in the nation. "Everything that’s electrical has a certain limit, a certain lifetime," said William Black, a professor emeritus of mechanical engineering at the Georgia Institute of Technology. In any single year, New York has 2,100 manhole incidents a year, or nearly six of them every day, Con Ed estimates. 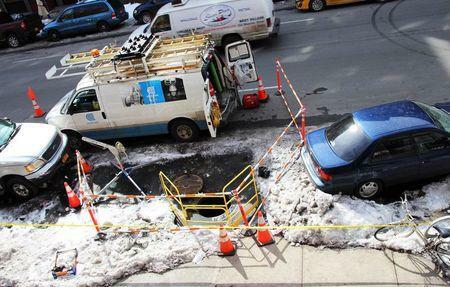 The problem is so much larger in New York than elsewhere in part because the city has the country's largest underground electrical system, with its 98,000 miles (157,716 km) of cable and 264,000 manholes and service boxes. To be sure, most manhole incidents are relatively harmless "smokers," but about 10 percent in the first week of February were more dangerous. Earlier this month, a smoking manhole exploded in Brooklyn, sending a worker scrambling for safety in an incident caught on video. On the same day, a parked Mazda was torched after a manhole beneath it started spouting fire. "Con Ed has a rather difficult situation because if you proceed to dig underneath the street you’ll see how congested it is," Black said. The problem is attracting attention. Donovan Richards, chair of the New York City Council's Environmental Protection Committee, is considering legislation to push Con Ed to spend more on modernizing its underground infrastructure. In 2014, Con Ed invested $1.3 billion in modernizing its electrical infrastructure, including the installation of nearly 1,600 miles (2,575 km) of underground electric cable. But that is just a fraction of the tens of thousands of miles in the system. Manhole events "take a considerable amount of time and resources," said Con Ed spokesman Allan Drury. "But our emphasis is on public safety and we are always looking for new technologies and methods to improve our system." For instance, the utility has been installing vented covers that allow for trapped combustible gases to dissipate more easily. Con Ed has teamed with the Massachusetts Institute of Technology and Columbia University to develop a tool that predicts manhole incidents through statistical modeling, taking into account factors such cable age and failure history. But Cynthia Rudin, associate professor of statistics at MIT who worked on the project, warns against focusing too much energy and money on replacing cables. "It is not a reasonable scenario to think of replacing the whole distribution network every few years or so," Rudin said.